Charting isn't simply a collection of a few trend charts, or a few indicators that work in one example. No matter how many lines and chart patterns are drawn on it, is not a rigorous backtest -- it's just a chart, at one specific time -- it really is. That's why technical analysis can feel so close to being profitable for a trader, and we can do so much preparation work, but at the same time the results, well, they never quite match up to the expectation. After rigorous testing over the ten year period from 2009-2019 and the period from 2007-2009, which included the Great Recession, and over 100,000 back-tests, today we demonstrate the technical conditions that have provided a strong short-term bullish momentum trigger for Equinix Inc , as well as, broadly speaking, the Nasdaq 100 index constituents. The goal is to create a portfolio of option trading backtests with alerts attached to them, so we don't have to stare at the screen all day, but rather use Trade Machine as the pattern recognition work horse to notify when the ideas become actionable. That means the backtester never opens a trade between the "black out period" of two before through two-days after an earnings announcement. * Trigger on the precise day that the stock crosses the 10-day exponential moving average (EMA) -- that's a trigger of a momentum breakout right at that moment -- an uptrend. * The stock is already above the 200-day simple moving average (SMA), which means that the stock is not in technical failure -- we're not after reversals, we are looking for "not a down trend." There is also some sentiment surrounding this particular moving average. * Stock prices are below the 50-day SMA means that it has room to run to the upside. * The Relative Strength Index (RSI), using 20-days, is below 70, so the stock isn't overbought -- there is little risk of being oversold with the prior signals in place. You can set an alert in Trade Machine®, which will track all of these moving parts for you, and message you when it triggers. In fact, you can do this with a portfolio of stocks for a portfolio of bullish and bearish triggers. Let Trade Machine do the work for you -- there's no need to stare at the screen. * Use a 40% limit gain and a 60% stop loss. At the end of each day, the back-tester checks to see if the long call option is up 40% or down 60%. If it is, it closes the position. This is not a magic bullet, rather it's a bullish technical analysis momentum strategy predicated on using pattern recognition in charts through moving averages and RSI, rather than manually drawling lines stock by stock. ➡ The average percent return per trade was -2.59% for each 14-day period. You can check to see the values of all the moving averages discussed above with real-time daily prices, including live after hours prices, for EQIX by viewing the Pivot Points tab on www.CMLviz.com. We compared this technical analysis trigger on the constituents of the Nasdaq 100 versus the results from the baseline. The baseline is simply owning calls and rolling them every two-weeks with the same stop and limit as introduced above (40% / 60%). Using rigorous technical analysis, as opposed to "that one chart that looked good that one time," we saw out performance over the 10-year period from March 2009 - March 2019, largely a bull market, as well as 2007-2009, the period which includes the Great Recession bear market. Further, we saw out performance in each sub period of one-year, two-years, three-years, and five-years. Finally, the win rates by stock were also higher, as were the average winning trade return for every time period. Why look at one chart one time, when you can test technical set-ups across hundreds of thousands of charts at once? We're now looking at 80.7% returns, on 1 winning trades and 0 losing trades. ➡ The average percent return over the last year per trade was 80.76%. 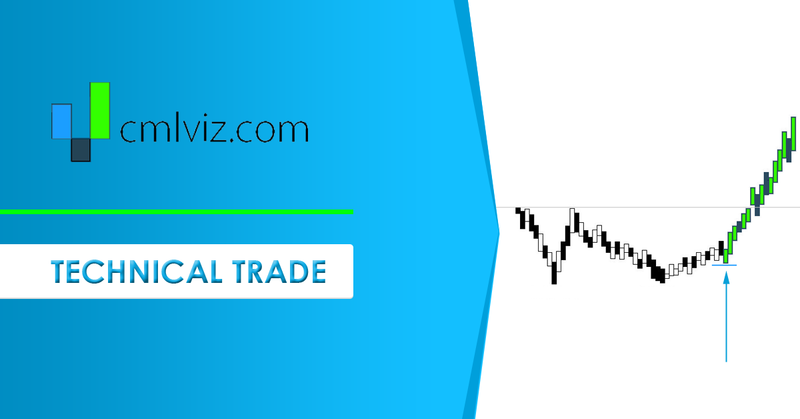 Tap here to use technical analysis with pattern recognition. You can do this.